How to get there: The best access is from Mitchell Lake trail head. This is located in the Lake Brainard area, well marked with signs. To get there take Colorado 72 north 20 km from Nederland to the small community called Ward. The Lake Brainard road goes west from Ward for about 8 km to Lake Brainard. The Mitchell trailhead is about one kilometer from Brainard Lake. Route description: Follow the trail from the trailhead to Mitchell Lake. We then found a nice, natural open "mini"-valley from the south-west side of the lake to higher ground in the valley that heads west towards Mount Toll. We generally stayed south (north of Little Pawnee) and skied a natural route climbing all the way to the very distinct basin south-east of Toll. (That is we passed Blue Lake substantially higher on the south side.) From here one can easily climb the saddle between Mount Toll and Pawnee Peak, however, we proceeded straight up (on foot) moderate snow all the way to the summit. (This is the snow just left (south) of the rocky ridgeline that separates the north-east side of the mountain from its south-east side.) 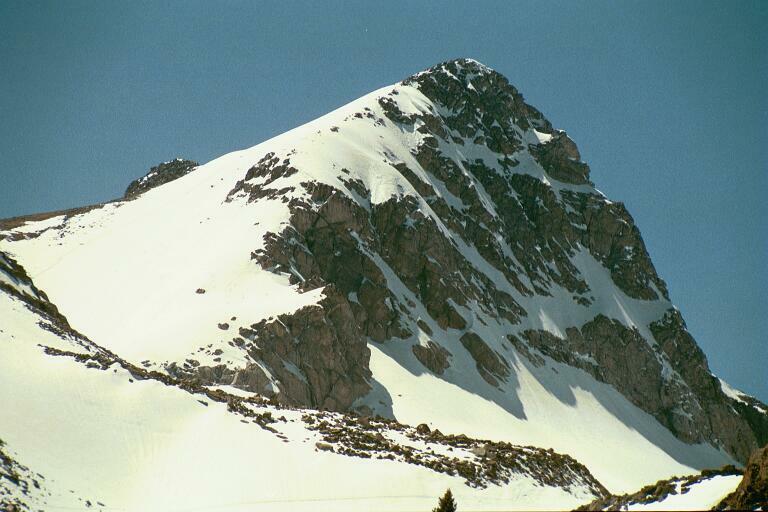 The snow slope becomes less steep as you approach the summit. With the snow we had we could easily have skied all the way to the summit, however with our packs and cross country skis the skiing down would not really have added any value to the trip. 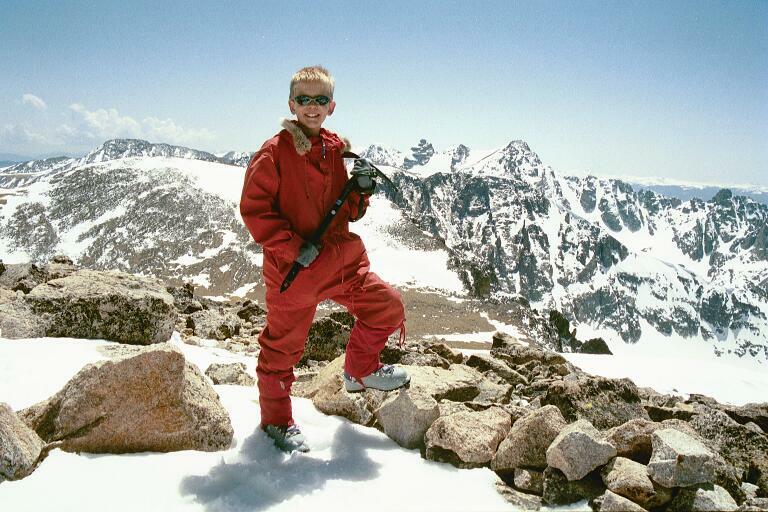 Comments: I did this very nice spring ski climb with my son Pål Jørgen, age 12. We did not pay much attention and skied to the Long Lake trailhead. 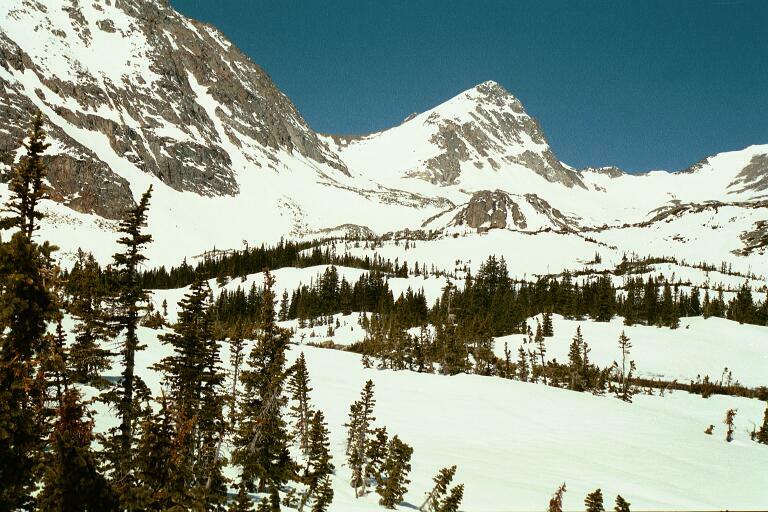 From there we traversed across to Mitchell Lake, it is not clear that this was any better than returning, but skiing in dense forest is always fun (early on the trip). We started at Red Rock at 0730, reached the summit after 6 hours at 1330, spent a very memorable 30 minutes at the nice dry rocks forming the summit. No wind, all blue sky and the warmest temperature yet this year. Lunch and hot drinks as well as our standard water, pictures etc. The view of Apache and Navajo is very nice, so also across to the (slightly higher) Mount Audubon. This is the Continental Divide and you feel it! Three hours brought us back to the car at 1700. Spring skiing in wet, but quite OK snow (as long as it supports my skis I am generally happy). The trip had not been possible without skis, so the 4 km carry (each way to Brainard Lake) was important. We saw nobody not even tracks, add that Boulder had clouds most of the day, we are fortunate that know what mountains can offer on what else would have been a "below average" Friday. Mount Toll, our approach contoured left here, followed the base of the snow under the rock face, up on the left of the rock formation that can be seen in front of Mount Toll, to the base of the very distinct snow slope. 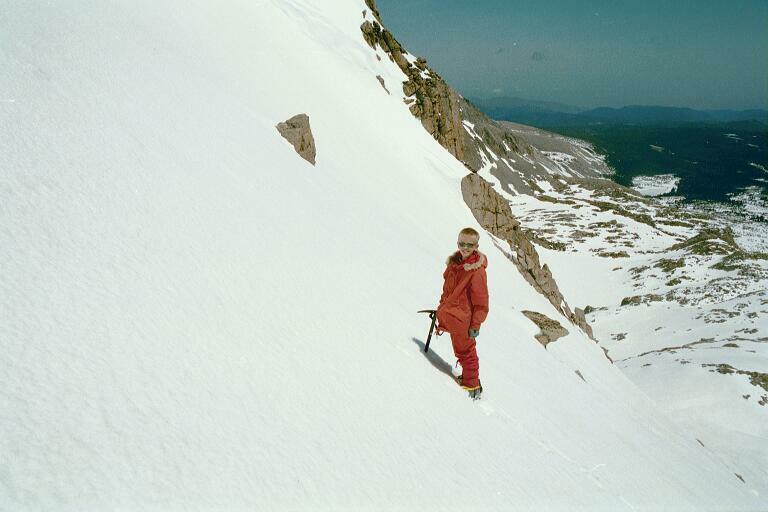 Snow climb on Mount Toll, the snow is moderately steep and Pål Jørgen is enjoying the climb. 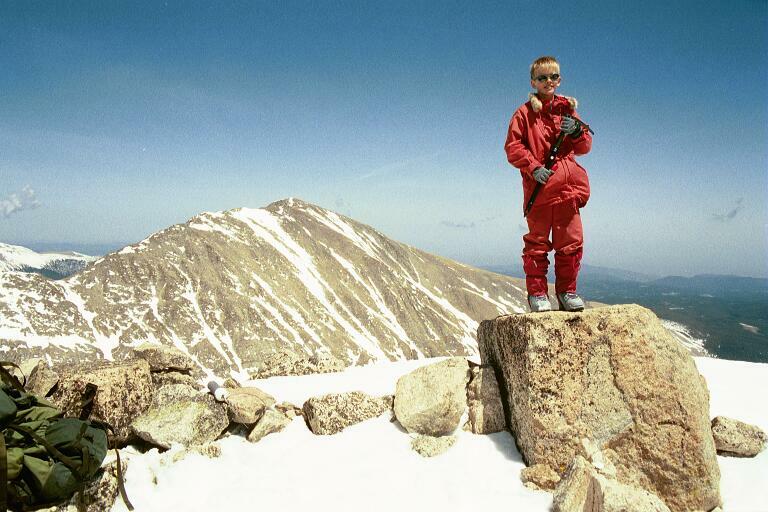 On the summit of Mount Toll, the view is towards Apache and Navajo.